One would certainly hope that the motor oil they chose could handle the rudimentary challenge of keeping a car running that had a tendency to stop and go. There are meaningful differences in motor oils and choosing the right one can have a major impact on how well your car runs. Selecting the right oil is often the quickest and cheapest way to improve your car’s performance and reliability. Two components determine how well motor oil will perform in your car. One factor is the base oil, and the other is the combination of chemicals (additives) that are added to the base oil. The two primary types of base oils used are mineral and synthetic. Mineral oils are by-products of refined crude oil. Refining helps to reduce the impurities but leaves molecules of all shapes and sizes. Synthetic oils are manmade compounds whose molecules are all the same size and shape; consequently, synthetic oil has less friction and performs significantly better than mineral oils. There’s been sizable growth in the use of synthetic oils over the years. In fact, synthetic oils are often what the factory uses in many new performance and luxury cars. Regardless of the base oil used, chemicals must be added to give motor oil the characteristics needed to do its job. Typical additives that may be added to base oil include detergents to reduce the formation of residue, defoamants to deter absorption of air, anti-wear agents, antioxidants and others. Although additives are typically only 15 to 25 percent of motor oil, they can impact a lubricant’s performance much more than the base oil. For instance, mineral based motor oil with a very good additive package can easily outperform synthetic motor oil with a mediocre additive package. There is no easy way for a consumer to determine the quality of motor oil’s additive package. Price is often an indicator of quality since the more advanced additives cost more to produce. Performance is the ultimate measure of additive package quality. Some of the biggest technological advances in lubrication are now coming through advancements in chemical additives. These breakthroughs have been developed by a handful of companies that specialize in high-performance lubricants, as opposed to major oil companies whose primary focus is refining and selling crude oil by-products like gasoline and other fuels. One high-performance lubricant company, Royal Purple, has developed lubricants that outperform both leading mineral oils and other synthetics. Their oil has been proven in numerous independent tests to dramatically reduce engine wear, increase horsepower and torque, and reduce fuel consumption and emissions. Cars using their oils can also go further between oil changes, saving the owner time and money, and reducing the impact on the environment. Their oils are commonly used by professional racers. Additionally, in an annual competition among America’s top engine builders, seven out of eight chose Royal Purple for their engines. Their products are available exclusively through select auto parts stores and service centers. * Good -- Mineral-based (regular) motor oils. These are the cheapest and most widely available oils. They typically use standard additive packages that provide minimum levels of performance and protection. * Better -- Synthetic motor oils. These man-made oils are more expensive that mineral-based oils but are still widely available. Their performance advantages come predominantly from the synthetic base oil used. They have a longer service life and offer some improvements in protection. They typically use the same additive packages found in mineral-based oils. * Best -- High-performance synthetic motor oils. These motor oils are the most technologically advanced oils. Although they significantly outperform mineral based or synthetic motor oils, they are about the same price as standard synthetic motor oil. They are typically only available through auto parts stores and select oil change centers. These oils primarily differ in their use of more advanced, proprietary additive technologies. Still confused? For a used car with little life left in it, stick with the cheap mineral-based motor oil. For a car you plan to keep for a few years and want to get a little better performance from, you should at least upgrade to synthetic motor oil. To get the most performance out of your car, truck or RV, or to protect a vehicle you really care about and want to last, upgrade to a high performance motor oil. Let's assume you reside in Turkey. People in Turkey ask that question in tuning forums, too. But Turkey, at least has 4 different seasons at the same time. If we go a little bit further, some people swim under 45 degrees Celsius, while some other people are skiing on the mountains of Antalya. All these two happen in the came city!!! So, can we recommend only 1 kind of weight for a motor oil under that conditions? No. The motor oil weight depends on the maximum and minimum temperatures and ONLY YOU know the maximum and the minimum temperatures in your area. The minimum and maximum temperatures in Istanbul-Turkey, the city where I reside are 0 degrees Celsius in winter (the minimum) and +30 degrees Celsius in the summer (the maximum). According to these data which look NORMAL, let's look at the above graph to find the right motor oil. 15 W40 in the NORMAL category looks like it suits best. the problem here is that the temperature data for Istanbul above are the average of the past years, so what if the minimum temp for this year is lower than the averages? So, what does using a 15W40 viscosity oil mean? If the maximum temperature in your are is +30 degrees in summer and the minimum is -8 degrees in winter, it means that you have a 10 degree margin in summer and 7 degree margin in winter, which means it is safe to use 15W40 oil in your area. In fact it is hard to find 15W40 nowadays in Istanbul, so I always purchase 10W40 instead. that means I will have protection down to -20 degrees Celsius in the winter. Heard of 0W40 is the best??? The best according to what?? Do you really think that 0W40 is necessary in your area, or this is only "a friend's" recommendation? 0W40 looks like an "all in one" solution, but it doesn't seem like natural. 0W40 means an oil protects down to -35 degrees in winter and up to +40 degrees in summer. I don't remember such a city. If you reside in Europe, in most areas 10W30 (-20 / +30) will be OK because in so many countries, the maximum temp in summer is no more than 20-22 degrees. • the maximum temp for your area in summer is: +26 to +28 degrees Celsius. A 10W30 oil will be OK for winter because it will protect down to -20 degrees Celsius but you may find "protection up to +30 degrees" insufficient, an may want some extra protection in the summer. You have to use an oil with 40 weight at the summer part this time, not 30. The difference between 10W30 and 10W40 weight oils is that they both protect same in the winter(down to -20 degrees), but the second one protects more in the summer (up to +40 degrees Celsius). But remember, you are now in summer and you don't need an oil which protects down to -20 degrees anymore. So, 15W40 will be OK, too. 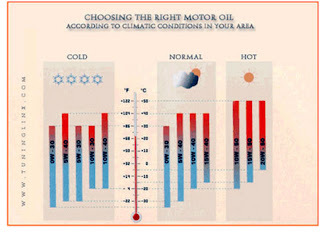 In fact there's no conclusion, cause choosing the right motor oil depends on the climatic conditions in your area. The only conclusion that may be is: "only you know the right motor oil". After choosing the most suitable one, you can just try the closest choices.